Can’t decide on what size, shape, color, or layout for your favorite photos? You’re not alone. Choosing between options for displaying photos can sometimes be difficult, and it’s a reason why many beautiful photos go un-ordered and reside unseen on your computer’s hard drive. In fact, it’s not uncommon that I encounter engagement and wedding clients who have a tough time trying to decide how they’d like their favorite photos prepared for hanging on their walls. Not only is it sometimes hard to imagine how your finished photos can look when hanging on a wall, but any two people can think differently about how the final photography product will look. But there’s a solution to all of this so that you can better visualize your photo print ideas. What I do is create a series of mockups of the various print and layout ideas, then graphically display them in a livable space. 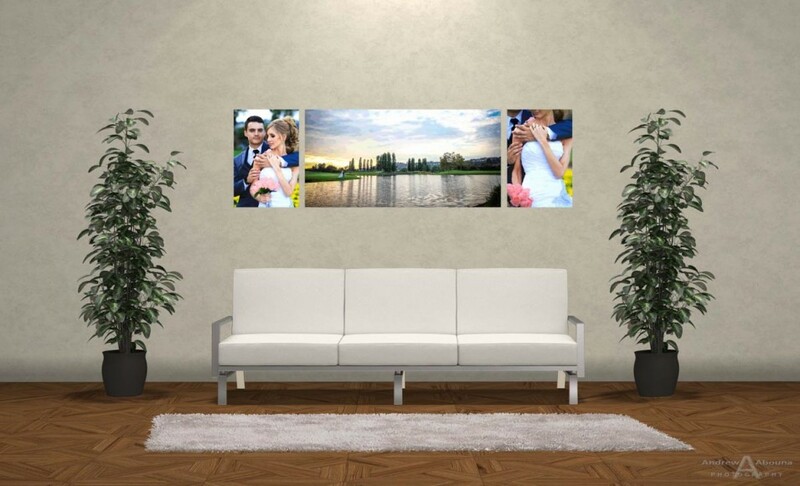 When the photo print ideas are shown in proportion to a room with furniture, my clients get a realistic visual of how their finished favorite photos can look. To give an example, I recently prepared a series of mockups of different photo print ideas for Julia and JD. The mockups helped the couple in selecting their favorite collage of wedding photos that I would create for them as large Metal prints. 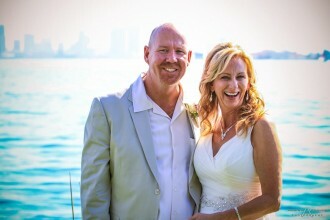 Initially the couple had narrowed down their favorite photo print ideas but weren’t completely sure which combination, arrangement of photos, size, and photo editing techniques they would like the best. So, after first visiting their home to talk about and measure the best placement and arrangement for their final photos, and to discuss their favorite photo print ideas, I set about creating a series of custom mockups. Shown here are the series of five different layouts that I created for Julia and JD from their wedding photography that I shot. 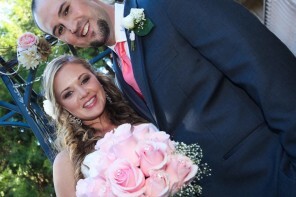 The layouts really helped the couple by making it easier for them to visualize then select their preferred choice from among their initial favorite photo print ideas. 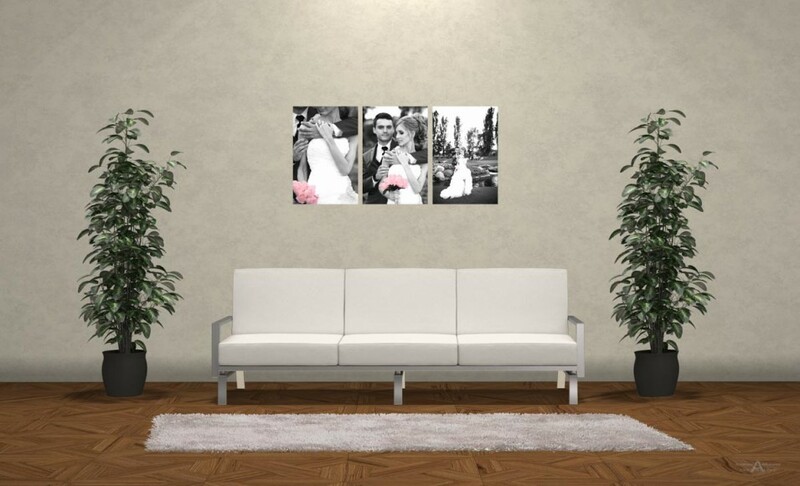 The couple chose the collage of three back and white Metal prints with colored bouquet. 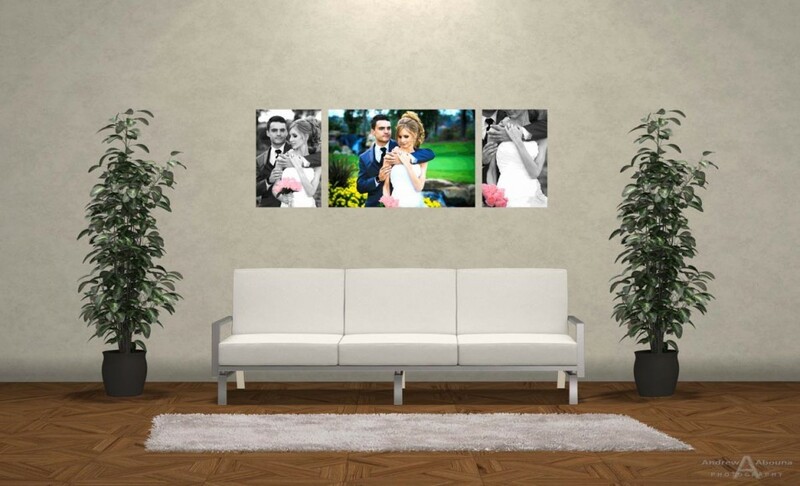 The resulting metal print wedding photos look fantastic, and I know Julia and JD will be very happy to see the metal prints hanging on their wall, especially since the professional metal prints will look much more brilliant than the helpful mockups portrayed. For more information about any aspect of photography, contact me anytime.